We have two great events coming up later this month. First up is our monthly invasion of Neo — Nexus 6! — on Friday July 17th. This month DJs Gremlin and Sprite will be joining Razer-X for the aural assault. Come to hear some glitch, melodic rhythms, and hard-pounding beats! We also promise not to play any MJ. No, really. Remember when we said we were looking for a July venue for Kinetic? Well we finally wrangled it out. 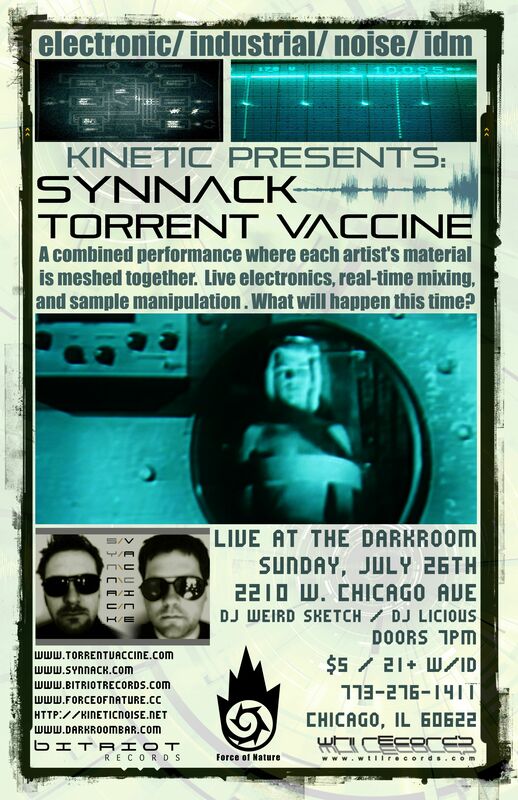 This month’s Kinetic will be Sunday July 26th at Darkroom, featuring DJs Licious and Weird Sketch. Even better, it will feature a live set from Synnack vs. Torrent Vaccine! But wait — there’s more! This show will also be a release party for the new Ad-ver-sary CD, A Bright Cut Across Velvet Sky, released on Tympanik Audio! This event is co-sponsored by WTII and Bit Riot and is sure to be a fun time. Note the early start time, given that it’s on a Sunday. This will be a fantastic event, so don’t miss it! ~ by infomorph on July 8, 2009.